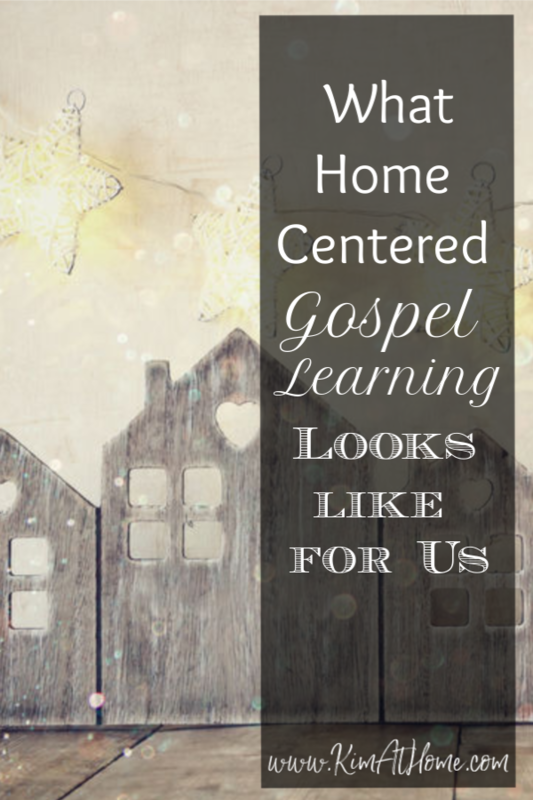 After the kids head to bed, my husband and I sit down to review the Come Follow Me Lesson for the coming week. We call it our weekly planning session! In the past, it has been up to me to plan Family Home Evening on my own or asking him to think of something to do when I haven’t had time. This is the first time that we’ve worked together as a couple to decide what kind of gospel instruction will be happening in our home and it is amazing doing it togehter! We pick 4 or so of the listed topics and divide them up as to who will teach which ones — that person will take the lead but we both contribute. If you’re a single parent or have older children, you could easily adapt this to have a designated time to prepare on your own or to work with older children who can be assigned to do part of the teaching. We have a short devotional every morning over breakfast. We started this last year and the kids (and I) love it so much that we’ve continued. And it’s super easy because there’s no planning involved. We use the LDS Daily Verse App (there’s a very small cost, just a few dollars for a year subscription after a free trial period). As the kids eat breakfast, I read them a scripture, and a quote, and then we watch a video and listen to a song. This has been one of my favorite things. On difficult mornings, because sometimes there are grouchy kids (or even a grouchy mom), it brings the Spirit into our home. It is one of the last things we do before family prayers and it helps the kids leave for school on a good note. Our older kids are supposed to read in their scriptures every morning. 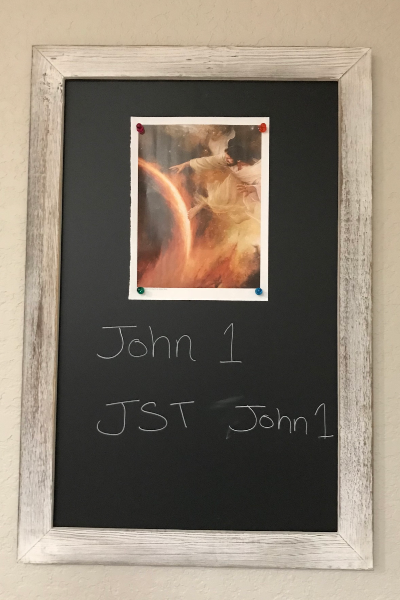 We’ve posted the picture that goes along with the week’s lesson (just torn from the manual) and written the scripture reading for the week on a chalkboard magnet board. It is simple and easy to keep up with! Right after dinner is our gospel learning time. This is when my husband and I teach the topics we picked from the Come Follow Me manual. We might sit at the kitchen table or hang out in the family room, whatever is most comfortable that day. 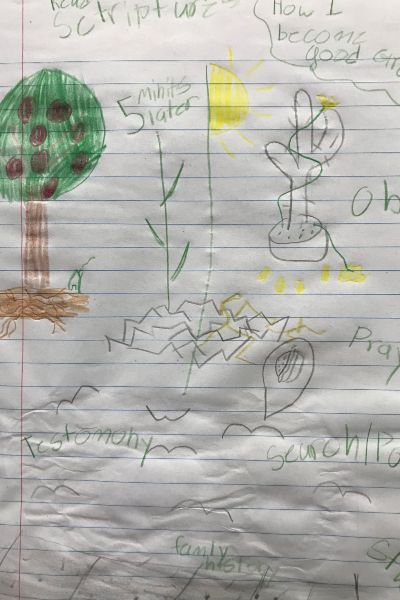 When we taught about the Parable of the Sower, we did it while walking around the yard and looking at different types of soil. Sometimes it’s 5 minutes, sometimes it’s 30 minutes. Sometimes it’s reading and marking scriptures. Sometimes it’s watching a video and discussing. We find that lecturing and straight reading from the scriptures doesn’t work as well, so we try to mix things up. But we like to make sure that whatever we are teaching, we are reading at least one verse straight from the scriptures. Mostly, we use what the manual suggests, then supplement with our own stories/experiences and other thoughts/ideas that we came up with in our planning session. We try to teach something interesting and then ask questions so the kids are involved (ages 4-10) — and we’ve had some great discussions! 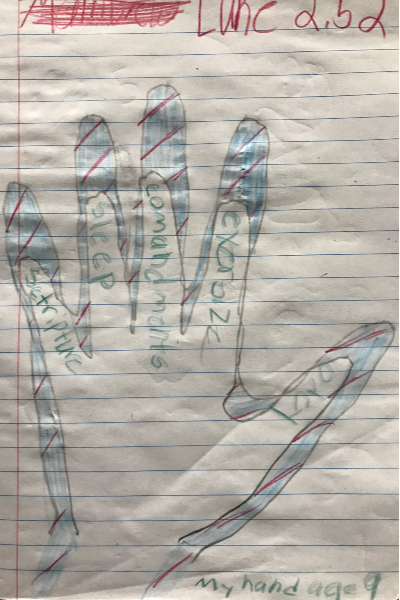 The kids each have a composition notebook and once a week, we try to do an activity where they do some kind of activity inside the notebook. Though sometimes, we just can’t come up with something to do in the notebook . . . and THAT’S OKAY! 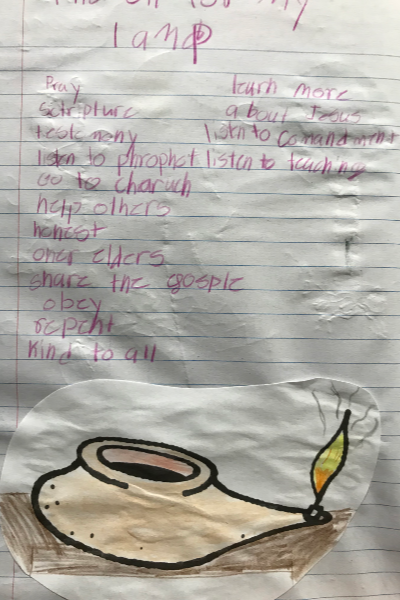 When we read from the scriptures everyone (including the 4 year old who doesn’t read) has a copy of the scriptures to open up and follow along and there are scripture markers on the table for them to use. 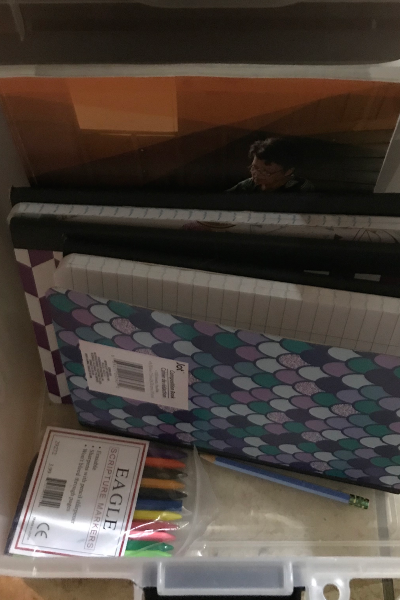 We keep a small file box filled with our notebooks and scripture markers right in the kitchen for easy access. Friday and Saturday tend to be off the regular schedule so we don’t plan on any kind of lesson on those days. We are a family that loves music. So, I’ve started using the LDS Sing-Along App to help us learn some new songs. I pick one new song each week and before we kneel for family prayer, we use the app and sing-along with that song. We actually put together a play list for the month so each week, we add a new song and sing all the songs (one right after each other) that we’ve learned that month. It is a great way to get ready for family prayer. Our ward is the middle ward for the meeting schedule this year. So, we don’t have to leave super early but our kids still wake up at 6am. 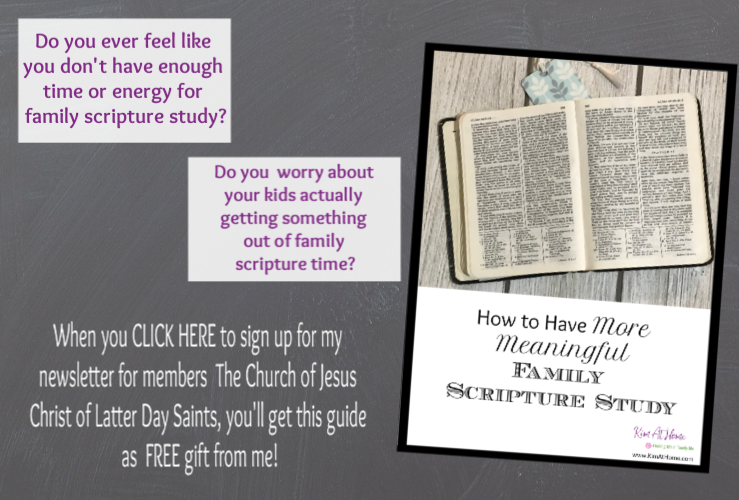 I heard one sister share the idea of trying to get to church on time, so her goal was to be ready 1/2 hour early and then spend that 1/2 hour in gospel study. We don’t have a struggle getting to church on time. In fact, we’re always there waaaay early since my husband is in charge of the bulletin and has to be there to get it copied and folded. The activities are all gospel centered things we’ve collected over the years. But things like coloring pages and activity pages can be pulled out of The Children’s Friend or printed off from online. We turn on some nice church music and they do activities at the table until it’s time to leave for church. It has been such a nice transition in our Sunday morning to get ready to head to church. I really believe that kids need free time to play and use their imaginations and our kids are the perfect age for doing just that. So, rather than go to 2 hours of church and come home for another structured hour of “church” at home, we’ve chosen to spread our gospel learning time during the week. I also believe there’s value in establishing a habit of learning about the gospel every day of the week, more than just on Sunday. That being said, we still wanted our Sunday to be a little more special than just a giant play day. When we get home from church, it’s time for lunch so we have our lunch time. After lunch, the kids are free to play for a while . . . like a couple hours. And they usually get to watch one video on Living Scriptures during this time, too. This is good relaxing time for my husband and I. Around 3:00, we gather back together for Sharing Time. We used that name because the kids were sad that Primary wouldn’t include Sharing Time anymore and “sharing” is exactly what we do. We gather in the family room and each member of the family gets to “share”. We limit it to 5 minutes max so they don’t go on and on all day. But it can be super short if they just have a scripture to share and then we talk about it. To be honest, the first week was super rocky. But this was something I had felt inspired to do. So we persisted and continued to teach the kids the vision I had in mind. And we also reminded them before church and after church that they needed to think of something to share. Now it has become one of my favorite family gospel learning experiences of the week. After dinner time, the kids are usually getting ready for the new week: picking up rooms, making lunches, getting backpacks ready, etc. and then it’s off to bed for the younger ones. Our oldest two who have a later bedtime have a quiet journaling time (along with my husband and I). Sundays used to be just a giant let-the-kids-play day. But with a little bit of structure, we’re definitely making it more of a Sabbath experience while still allowing some unstructured play time as well. I feel really good about the schedule for gospel learning that we’ve come up with. It’s not perfect. There are days when it’s a struggle. Days when the “lesson” has to be cut short or kids have to be firmly reminded about how to behave. But over all, it works for us! It will take flexibility as kids get older and different situations change and we’ll be open to that, making adjustments as we go. A great way to start is to have a family council. 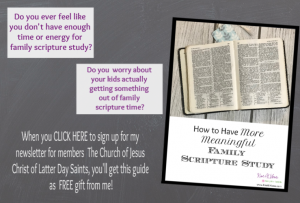 That’s how we discovered some of the things our kids really wanted to do when they were asked how THEY wanted to study the gospel as a family. It makes all the difference to have their “buy-in” and their ages help as well (no teenagers and no toddlers). Maybe some of these ideas will help you — I hope they do! If nothing else, I hope it helps you to be inspired to find what works for you and to share it with others. I know that I would LOVE to hear what is working for you, please share in the comments & go ahead and share this post with others who would want to be involved in the discussion, too. The more we share, the more we can learn from each other!